NASA astronaut Shane Kimbrough is pictured moments after entering the International Space Station after a two-day trip aboard the Soyuz MS-01 spacecraft. Commander Anatoly Ivanishin (right) films the arrival of his new crewmates. The newly-expanded Expedition 49 crew is getting ready to grow lettuce to learn how to grow fresh food in space. Meanwhile, the International Space Station is getting ready for another crew swap. New station crew member Shane Kimbrough is installing hardware and plant pillows for the Veg-03 plant growth experiment. The study is a validation of the tools and procedures necessary to grow plants to provide fresh food for astronauts. He and his Soyuz crewmates Sergey Ryzhikov and Andrey Borisenko are in their first week aboard the station. They are familiarizing themselves with their new home in space where they will live until February. 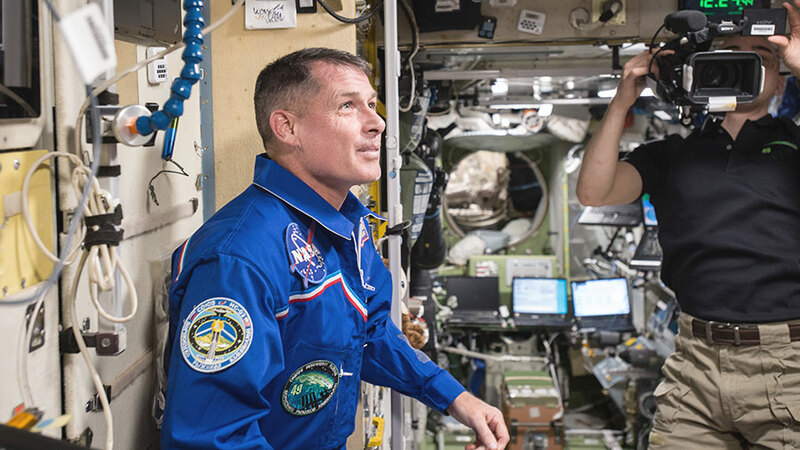 Astronauts Kate Rubins and Takuya Onishi are researching how living in space affects breathing for the Airway Monitoring experiment. The duo were in the U.S. Quest airlock performing measurements to determine how much nitrogen oxide is exhaled and is diffused in the blood. Commander Anatoly Ivanishin is packing the Soyuz MS-01 spacecraft that will carry him, Rubins and Onishi back to Earth Saturday night ending their four-month mission. They will be replaced in mid-November when Expedition 50-51 crew members Oleg Novitskiy, Peggy Whitson and Thomas Pesquet arrive inside the Soyuz MS-03 spacecraft.